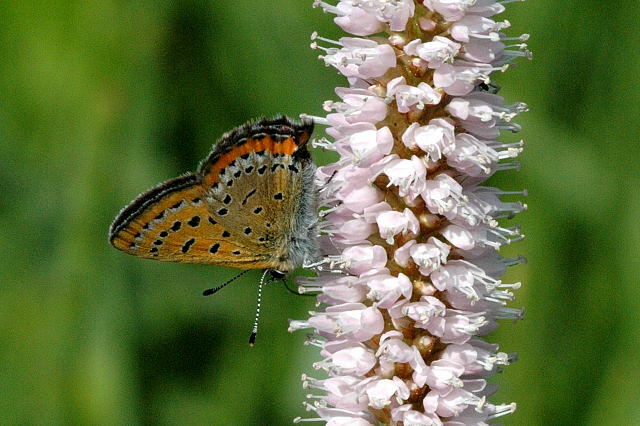 The butterfly species Lycaena helle and Parnassius apollo show similar distribution situations. L. helle represents a boreomontaneous species, which showed its maximal distribution over Europe during the early postglacial. Because of the climatic changes during the last thousands of years, this species extinct in most of the earlier distribution area in central Europe. Today, large populations are located in Scandinavia and the high European mountains, while some relict populations still exist in Europe (e.g. Ardennes, Eifel, Hohes Venn and Westerwald). The xeromontaneous butterfly species P. apollo shows similar distribution history like L. helle. That species is present over most parts of Scandinavia and the Alps and disappeared from most historical habitats in central Europe.Some relict populations (e.g. in the Mosel valley) are recently in a stable and vitale stage, which represent mostly subspecies. 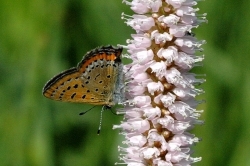 Both species are selected to test phylogeographic and nature conservation genetic scenarios. Modern moleculargenetic markers enable to analyse the genetic structure over the European distribution area (molecular taxonomy, phylogeography and molecular biogeography) as well as conservation genetic aspects (habitat isolation, minimum viable population size, genetic depressions) in a smaller spacial scale. The selected molecular markers (detection of mikrosatellite-DNA and sequencing of mtDNA) enable us to analyse individuals, collected in earlier times. With the subspecies P. apollo viningensis, a genetic time series over the last decades will show us potential genetic depressions during the 70s; during this periode many populations of this species declined because of the intensive use of pesticides, which could lead to population bottlenecks. In the case of P. apollo vinningensis, morphometric analyses (fluctuating assymetry) will complete and verify our genetic data set. Many lepidopterologists helped us to collect the species and/or showed us adequate sites (in alphabetic order): Leif Aarvik (As, Norway), Philippe Bachelard (Églisolles, France), Beyer (Bad Tölz, Germany), Ralf Bolz (Ullstadt, Germany), Jaroslaw Buszko (Torun, Poland), Klaus Cölln (Gönnersdorf, Germany), Klaus Fischer (Bayreuth, Germany), Danièle Fournier (Lyon, France), Philippe Goffart (Gembloux, Belgium), Yves Gonseth (Neuchâtel, Switzerland), Povilas Ivinskis (Vilnius, Lithuania), Maria Jerabek (Salzburg, Austria), Juha Laiho (Helsinki, Finland), Anna Lundhagen (Uppsala, Sweden), Frédéric Mora (Besançon, France), Marko Mutanen (Oulu, Finland), Andreas Nunner (Freiburg, Germany), Edward Palik (Krakow, Poland), Josef Pennerstorfer (Wien, Austria), Jean-Christophe Ragué (Gérardmer, France), Lazlo Rakosy (Cluj, Romania), Markus Röhl (Freiburg, Germany), Nils Ryrholm (Gävle, Sweden), Peter Sonderegger (Biel, Swizerland), Panu Välimäki (Oulu, Finland), Volker Wachlin (Greifswal d, Germany), Roland Weid (Munich, Germany), Elisabet Weingartner (Stockholm, Sweden). Postdoc granted by the Luxembourg Ministry of Culture, Higher Education and Research. Duration: 2 years (01.05.2006-30.04.2008).